This month, we honor Earth Day on April 22. 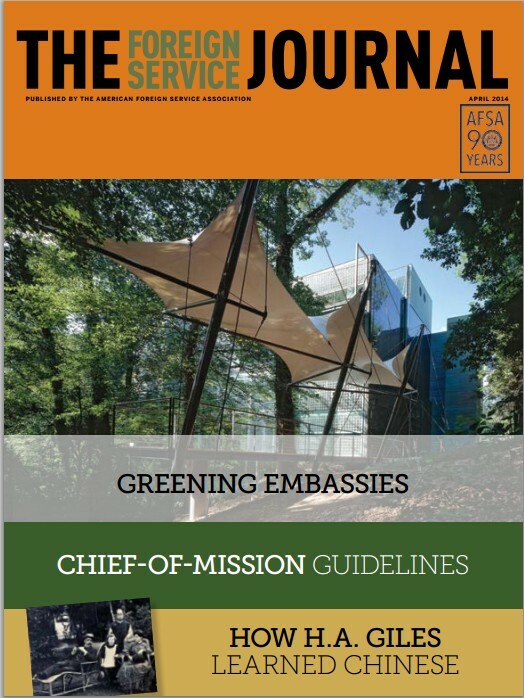 In the issue’s focus on “Greening Embassies,” the Journal looks at the dynamic efforts to improve energy-efficiency in American embassies throughout the world. The focus highlights the more than 150 U.S. embassies and consulates actively engaged in making facilities more environmentally friendly through the use of sustainable technology. It also profiles the Department of State’s Greening Diplomacy Initiative as well as the League of Green Embassies. Giving an insight into other countries’ efforts, Finnish diplomat Emilia Honkasaari tells the story of the Embassy of Finland in Washington, D.C., a pioneering structure among green embassies and the first to achieve LEED certification. In this month’s feature, Phebe Xu Gray reflects on How H.A. Giles Learned Chinese. She highlights the late-1800s linguistic journey of British diplomat Herbert Allen Giles. In our monthly columns, Susie Martineau reflects on her life as “global nomad,” Tyler Sparks advocates for bringing back the Powell Fellows Program, and AFSA President Robert J. Silverman shares his perspectives on the reasons to love the League of Green Embassies. U.S. embassies and consulates around the world are becoming showcases for American leadership in best practices and sustainable technology. State’s homegrown Greening Diplomacy Initiative relies on seeding, harvesting, sifting, implementing and sharing employees’ innovations and ideas, large and small. A coalition of more than 100 U.S. embassies and consulates worldwide shares ideas and practical experience in the field. The life and work of Herbert Allen Giles offer insights for many Foreign Service members—particularly those who embark on the kind of linguistic journey Giles undertook as a young diplomat.